Long lasting, less transfer, and it smells fantastic! Arctic Fox is a 100% vegan & cruelty-free, long-lasting, semi-permanent color line that gives 15% of profit to charity to help save animals in need and prevent animal abuse. Our color is highly pigmented and formulated with non-gmo, plant based conditioning protein. There is no PPD, harmful chemicals, peroxide or ammonia in our color. Arctic Fox contains no drying alcohols, PPDs, or harsh chemicals. We spent two years of research and development to formulate a color that is highly pigmented, bleeds less, and won't stain your sinks. 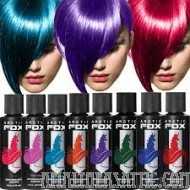 Arctic Fox is long lasting semi-permanent color that is easy to work with, conditioning and smells great. All semi-permanent colors will fade, but not all fade equally. Arctic Fox is formulated to fade within the original color spectrum, so as the color fades the shades will continue to be the gorgeous tones that your clients wanted. This also means creating lighter shades and pastels with our diluter, Arctic Mist, is much easier and more accurate than ever before. In addition to making great color, Arctic Fox also donates 15% of their profits to help prevent animal abuse, and they are (and always will be) 100% cruelty free and vegan. Your purchases and loyalty support a domestic organization called Second Chance Animal Shelter, and International Fund for Animal Welfare. At Second Chance, they work tirelessly to find homes for animals, and they run numerous clinics to treat sick and injured animals as well as provide spay and neuter services. The IFAW focuses internationally on animal rescue; saving seals, elephants, tigers and defending whales. We are thankful for your support. Aqua, Cetyl Alcohol, Glycerine, Glycerol Stearate, PEG-100 Stearate, Propylene Glycol, Stearalkonium Chloride, Guar Hydroxypropyltrimonium Chloride, Quaternium-52, Cetearyl Alcohol, Ceteareth-20, Hydrolyzed Soy Protein *No unicorns, faries, mermaids or other creatures (mythical or not) were harmed in the making of Arctic Fox. To apply: Hair should be clean and dry. Wash and dry hair, but hold off on the conditioner, as some of the oils and silicone products in conditioner can inhibit the color from applying evenly. We receommend leaving Arctic Fox on for at least 30-45 min for best results. Rinse with cold water and lock in the color with your favorite cutical closer. 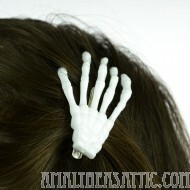 Arctic Fox also works great on extensions! Be sure to pre-wash the extensions with a clarifying shampoo, don't use any conditioner, and thoroughly dry the extensions before applying Arctic Fox. 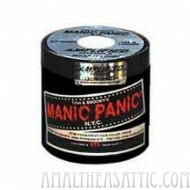 Manic Panic Hair Color Creams are packaged in our classic 4 oz. tub. 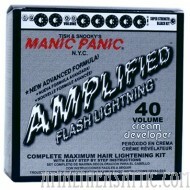 Manic Panic is a conditioning semi-permanent hair color fortified with an herbal and protein complex. It can be used to achieve intensely bright colors on hair that has been professionally lightened to a very light blond, and on some natural blond hair. 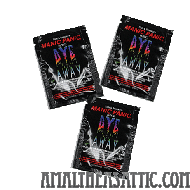 We carry Manic Panic Raven to fill out our demi permanent rainbow! 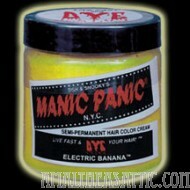 Since Special Effects Bright as F*&K Yellow is a rare commodity (they only sell it for a limited time each year and it tends to sell out REALLY quickly,) we're bringing you Electric Banana by Manic Panic (we also carry their Raven Black for the very same reason!) If you want to look like woodstock after he sucked on an electrical socket, this would be the dye for you. For the absolute best results, please check out our blog's how to pages in the webpage link below! This dye is UV reactive, so you'll be glowing in the clubs.